Michael Ackerman and Stéphane Charpentier will share with you their instinctive and sensitive approach to photography. They will focus on meaning and expression, rather than form and technique. Everybody should feel free to search, experiment, break borders, make mistakes, take emotional risks, all in the goal of getting closer to themselves. The core of this experience is to release each participant’s own vision and subjectivity. Each one will receive insights on how to connect with the inner artistic impulse and how to better engage with their own personal projects while developing collaborative presentations alongside the sound artists of the workshop. Participants are encouraged to use digital during this short period of work. With Alyssa Moxley, students will explore techniques of working with field recordings in installation, surround, or stereo speaker environments, in tandem with moving and still images. Artists will be encouraged to develop collaborative vocabularies to prepare for improvised live scoring with consideration of abstract and narrative elements of image, spatial environments for the 2d, psychoacoustics, and improvised orchestration. Through personal understandings of the meanings of sonic relationships, students will create dialogues with the images, while using field-recording material to develop essayistic yet musical compositions. Participants are encouraged to bring microphones, laptops, and other sound processing equipment. Void with its experimental approach, will create a limited edition, handmade publication using the material (both image & sound) produced during the workshop. Michael Ackerman has made his mark by bringing a new, radical and unique approach to photography. His method doesn’t follow tradition, it is not a simple chronicle of events. The pace of his photography is closer to cinematography than traditional documentary: images used in sequences, different formats, pictures that appear «wrong», images used as links between other images; all used to compose an essay that does not value where or when the pictures were made but rather attempts to capture a deeper emotional and spiritual truth of the subject. Stéphane Charpentier engages an introspective photographic language to build long-term analog series. His images drive to moments suspended between an endless vision of humanity’s struggles and hopes. He also creates short artistic films, installations and some music videos. He collaborates with various musicians and took part to the creation of oiseaux-tempête band. He has been part of several photographic curatorial projects including the Gomma Grant 2016 & 2017. He is curating, promoting and editing the Temps Zero projects since 2013. His first book "The Core" was published by Void in 2017. Alyssa Moxley works with sound, installation, and collaborative projects. Using multiple sources, tools and techniques (field recordings, experimental microphones, instruments, sound design and speaker placement). She uses sound to evoke memory as a personal and shared medium. 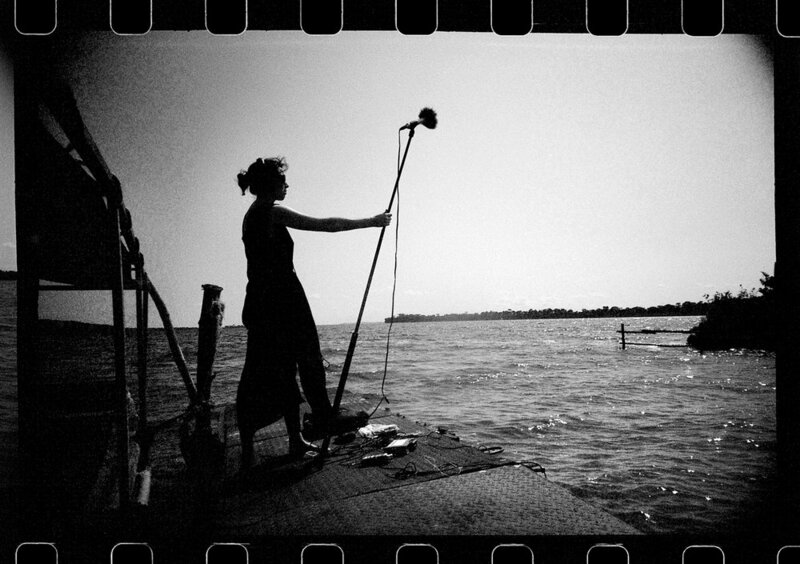 Her field recordings gathered from extensive travels access narratives of identity, place, space, and embodied experience. Amongst her performances, Alyssa took part in the temps zero show in Braga 2015, and she instructed the first Temps Zero workshop in 2017. She has curated various sound events, including the Kinisi festival of sound. Following the concept of the Temps Zero performances produced all over europe since 2013. Presenting works from acclaimed photographers & rising talents, & sound artists creating unique live soundtracks, we are organizing for the second time a workshop open to visual & sound artists. Void is a project fully dedicated to photography. Found in 2016, Void is an independent publisher, an alternative exhibition space in the heart of Athens. Void is a non-profit organization, and its goal is to publish established and up-and-coming artists both from Greece and abroad, as well as invest funding on education projects in Greece. Submissions are closed for this workshop.